Did you ever wonder what goes on in your garden when you aren't looking? Who might be visiting? I went out to the vegetable garden a little bit late this evening, just for a quick check in the last light of the day. It's important to check the garden every day. After all squash can grow to quadruple its size in one day or tomato hornworms can decide that your prize heirloom tomato plants are just the place to rest and eat, and eat, and eat. 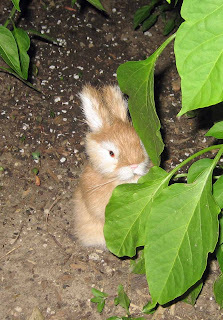 Or as in the case of my garden, mysterious bunnies can show up amongst the beans and peppers. And the spoons that you use to keep the bunnies out of the beans can grow to twice their size. My garden has been invaded! Just who, oh who, could have visited my garden today to plant giant spoons and leave three 'stuffed' bunnies, which are the best kind of bunnies to have if you are going to have bunnies at all? What forces have been at work out there? This took some planning. Some scheming. Some nerve. Tomorrow in the first light of day, I'll be inspecting the garden more closely, looking for footprints, checking for other 'surprises', and most certainly counting my squash! What went on in your garden today? All I know is it wasn't me! Using my awesome powers of deduction, I believe it's safe to say the suspect's name begins with the letter S (for sneaky) and s/he most likely had accomplices. This is too funny! If the stuffed bunny hadn't made me suspicious, I would have fallen for all this. You have such a green thumb, Carol, I would have believed you could get the plastic spoons to grow. that bunny is a mutation - aren't you affraid to grow vegetables in such place where rabbits mutate so weird? 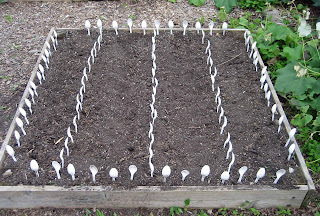 I would have been thoroughly impressed if those were metal spoons you were trying to grow. Because my first question would be, do you really have that many spoons? It's usually the first utensil in my house that magically disappears on it's own. No help from me either! plastic spoons. The quirky gardener does it again. What a hoot. Someone that has little time and lots of creative energy on their hands was at it. Maybe someone that lives in a Zoo? Of course my DB and I were in Lebanon yesterday visiting family. We didn't have time to swing by your place though. Isn't wasn't anyone at the zoo! What a hoot! I suspect the next door neighbor was in on it accompanied by some co-workers...Carol, did you slip some hoe pictures into a budget presentation again? Are your employees getting even with you? he he ..pesky wabbits..bizarre happenings at your gardens, for sure.! Another really fun post and a good way to start the morning...what went on in my garden?...no tricksters were here just me and the plants.. I nice post for a smile! 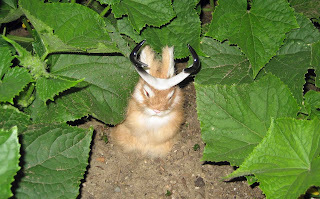 So what is that last bunny... a jackalope? LOL - this is brilliant! 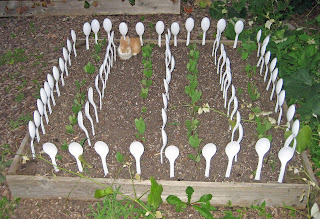 What a fantastic prank to play on a gardener, especially one with spoons in the garden, but the rabbits alone are a great prank. Whoever did this put a lot of time & thought into it. Hope the jackelopes don't eat as much as the bunnies. Whoever did it knows you well. What a perfect practical joke. You've outdone yourself...again! So when is that book deal going to come in, I wonder. Love it. If it wasn't you, let us know if you find the joker. I see the plastic spoons didn't work though! I totally thought that was a really bunny and my only thought was, "They have way cuter bunnies in Indiana!!"